Well lookie here, sometimes those old Wish Lists do work, even if you have to buy the stuff yourself. 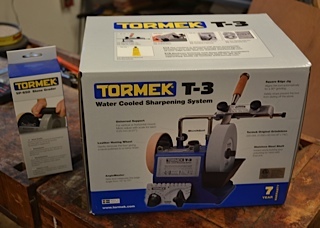 And then when you combine the Wish List with a New Year’s Resolution, you end up with the Tormek T-3 Sharpener from the High. As I’ve said before, I was starting to get really tired of buying new tools because the old ones got dull. Sharpening seems to be the answer, do you think? Last fall I went to a class in North Carolina and the instructor brought his T-3 for the students to use. Since most students were fishermen and not woodworkers, trying to teach that bunch to sharpen would have been a real trial. When I saw how it worked, it started to dawn on me that this little machine could be the answer to my sharpening trials. Not willing to spring for the T-7, I settled on the T-3. When I opened the package, there was a CD with instructions plus a guide book. But the thing I really like was what was next. That little yellow pack is a bundle of bandages with a caution on it. I like that. That’s about how sharp I want my tools to be. When I unpacked the rest of it, the grinding wheel was easy to install. The big wheel is a 200 grit, but I bought the dressing stone separately, and using it you can change the grit for the big stone. Set the dressing stone on the wheel while it is running and if you use the coarse side, the wheel gets much rougher and faster cutting. Turn the dressing stone over and the big wheel gets smoother and really polishes up an edge. 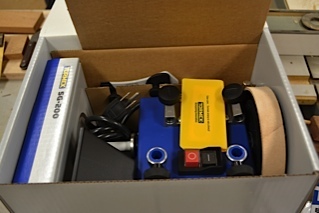 Unpacked, the box contains the square edge jig, the water tray, polishing paste, universal support guide bar and an angle setting gauge. The leather honing wheel comes installed and just needs a little machine oil with some paste added to make it operable. I picked up an old chisel which needed a lot of work and gave it a try. The angle of the tool to the wheel is set by raising the guide bar up and down with the screw at the top of the body of the machine. When you install the bar in the position shown, then the wheel is grinding towards the tool (clockwise), and the way you can tell when you are done is to feel the burr on the top of the edge. No burr, and you ain’t there yet. The tool in the picture was so bad, that I finally took it over to the half speed grinder and did a little shaping before putting it back on the Tormek. When you finally get the burr, then take it out of the jig and gently use the leather honing wheel to smooth it out front and back, being very careful to not round the edge. The guide bar can also be mounted on those front clamp holes and then the wheel will grind away from the tool. I’m sure it makes a difference for some things, perhaps the smaller carving gouges. Since the wheel turns slowly and runs constantly in water, there is no danger of burning the tool edge. You do need to take the tray off when not using the machine so the water does not affect the wheel. 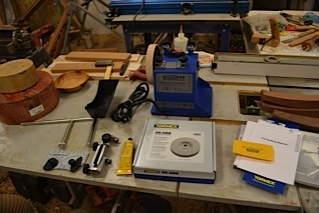 They make an accessory kit for Wood Turners and another for Hand Tools. 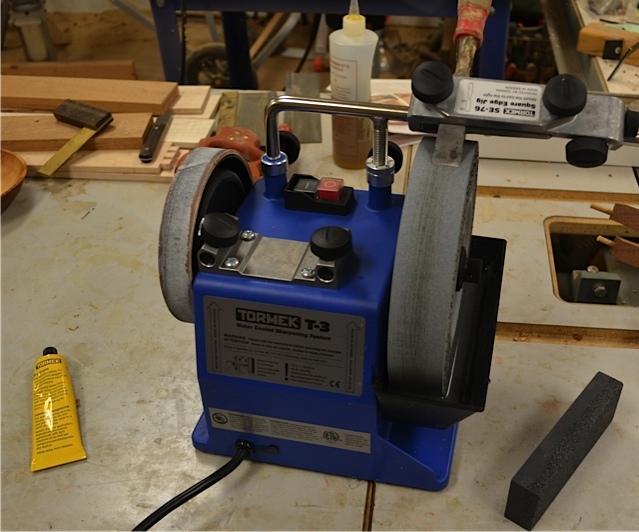 This may be the perfect sharpening machine for the small shop. Stop buying new tools just because the old ones are dull.